Difficulty 4 / 5This song has difficult chord diagrams or a more challenging pattern. CommentLeave a comment below! Print this song Simply click this little printer icon and your browsers print screen should open. Report Issues Having troubles with this tab? Do you have some improvements? Report it! Her blood, on my bones. Let go, lay to rest. We fall to the ground. While the young, they wait alone. So get up, shake the rust. We crawl on the ground. Alone, I fight these animals. Alone, until I get home. We share the same cold meal. I float on, float on down. We ride it all out. Coming back, I'm coming back. 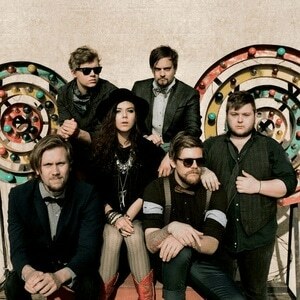 Of Monsters and Men are an indie folk band which formed in 2010 in Keflavík/Garðabær, Iceland. The band consists of Nanna Bryndís Hilmarsdóttir (vocals, guitar), Ragnar Þórhallsson (vocals, guitar), Brynjar Leifsson (guitar), Kristján Páll Kristjánsson (bass), Arnar Rósenkranz Hilmarsson (drums) and the former member Árni Guðjónsson (keyboards, accordion), who left the band in 2012. The band released their debut album "My Head Is an Animal" in September 2011.